Burberry Brit Splash is a bright fragrance that will emphasize the irresistible energy. 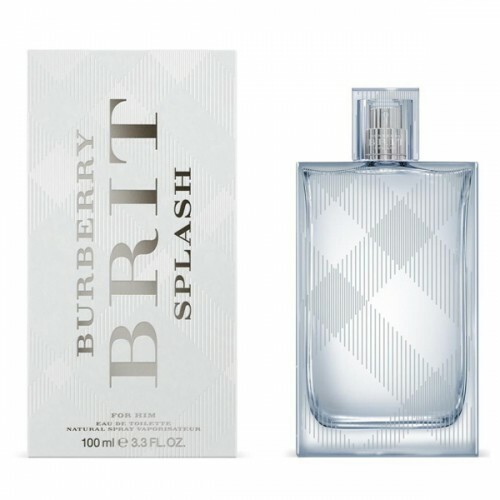 Burberry Brit Splash 100ml. Eau De Toilette is a light breeze, bringing with them the freshness and purity of cold clear water ... A soft fragrance of freshly sawn wood, still moist, warmed by the sun ... Do you want to experience a scent on your skin? Then the new perfume creation from Burberry fashion house - exactly what you need! The composition, designed for the most advanced modern men who know exactly what they want from life and how to achieve it, called Brit Splash. The fragrance of the toilet water fills the space of trees and water accents, beginning with an intriguing trio of juicy melon, tart galbanum and spicy rosemary. Then you enveloping veil delicate violets and cyclamen in the clear dewdrops. Approaching the spectacular finale, perfume gives easy mossiness, smoke enveloping vetiver and musk languor. Noble bouquet for stylish men. Refreshing masculine fragrance Burberry Brit Splash is inspired by the atmosphere of the summer London. This fragrance will completely refresh and at the same time is able to uniquely underline your personality. The men's toilet water Burberry Brit Splash with you at all times feel elegant. Become a true gentleman, even during the hot afternoon! Men's Burberry Brit Eau de Toilette Splash is composed mainly woody and aquatic tones that give you a very pleasant feeling of freshness. This bewitching freshness feel immediately at the beginning of smell, which opens tones of sweet melon. Furthermore aroma fragrance consists of Galbani intoxicating and captivating rosemary. The heart of the fragrance is hidden cyclamen, delicate violet and unusually refreshing water chord. Basis fragrance Burberry Brit Splash is filled with sensual notes of musk, vetiver, and the soft moss, which highlights the uniqueness of this fragrance. Exclusive Eau de Toilette Burberry Brit for Men Splash is very encouraging, full of energy, charm and excitement. Charging your electric energy of London and its airiness together with refined ingredients you absolutely get. Surround yourself with the fragrance, which is exceptional as London and enjoy its freshness from morning till night!